Industrial gears find vast usage across a number of industries owing to the reduction in mechanical work they bring about in a variety of industrial processes and operations. Industrial gears have equally expansive applications in heavy industries as well as in different manufacturing industries. Forming the core of most machinery used extensively in a vast array of industrial processes, the market for industrial gears in the highly industrialized European countries is expected to expand at a healthy pace in the next few years. Transparency Market Research estimates that the market will exhibit a 4.5% CAGR over the period between 2016 and 2024. At this pace, the market is expected to rise from a valuation of US$24.21 bn in 2015 to US$35.23 bn by 2024. On the basis of gear types the market is bifurcated into helical gears, bevel gears, worm gears, spur gears, herringbone gears, hypoid gears, crown gears, skew gears, spiral gears, non-circular gears, epicyclic gears, harmonic gears, and magnetic gears. Of these, the segment of helical gears held the dominant 12.4% of the overall market in 2015, in terms of revenue. The segment, however, is expected to witness a sizeable decline in its share in the Europe industrial gears market by 2024 owing to issues such as the production of more heat, less efficiency, and higher maintenance cost as compared to other gears. Gear varieties such as worm gear, herringbone gear, and magnetic gear are expected to gain more focus and witness increased adoption across a number of industries over the period between 2016 and 2024. The segment of magnetic gears is expected to exhibit the most promising growth over the said period, an estimated 6.6% CAGR from 2016 through 2024; light weight, compact designs, and low costs of these gears are expected to work in their favor. 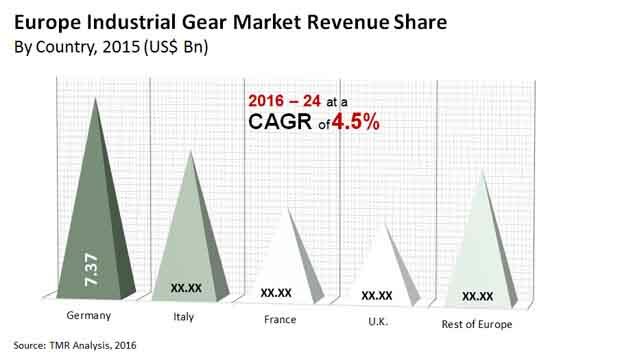 In terms of geography, the Europe industrial gears market is examined for U.K., Germany, Italy, France and Rest of Europe. Of these, the market in Germany dominated in terms of revenue contribution to the overall market in 2015. The presence of a large number of industries and a steadily expanding manufacturing sector in the country is fuelling the demand of industrial gears. Over the forecast period, however, the market for industrial gears in Germany will lose prominence to other regional markets such as France, Italy, and countries in the Rest of the Europe segment, including Spain, Belgium, and the Netherlands. The Rest of the Europe segment will exhibit the most promising pace of growth, an estimated 5.5% CAGR from 2016 to 2024. The market in this region will primarily benefit from the flourishing manufacturing industries like construction, steel, and iron. Some of the key players in the industrial gear market are Siemens AG (Germany), Klingelnberg GmbH (Switzerland), Precipart Corporation (U.S.), RenoldPlc (U.K.), BonfiglioliRiduttori S.P.A. (Italy), BMT International S.A. (Luxembourg), Rossi SpA (Italy), Getriebebau NORD GmbH &Co. KG (Germany), NGC (China), and Sumitomo Heavy Industries Ltd. (Japan). This report provides strategic analysis of the Europe industrial gearmarket, and the market growth forecast for the period 2016 to 2024. The scope of the report includes competitive analysis of various market segments based on the types, end use industries of the industrial gear market. Spur gears are the simplest type of gears that have straight teeth and are mounted on parallel shafts. These gears are used in material handling equipment, power plants, steel mills among others. Demand of these gears are high as they are easy to install and are compact, reliable and can transmit huge amount of power. Due to easy installation and reliability of these gears, spur gears is acting as one of the key trend in the industrial gears market in the region of Europe. Another major advantage of these gears is that it offers constant velocity ratio.Europe industrial gear market is mostly privatized and the industry comprises both international and local companies. Considering the new technologies introduced in the industrial gear market, the market provides attractive opportunities for the manufacturers of industrial gears. As a result of which, the market is experiencing an important level of competition. Industrial gears help in reducing the mechanical works in industries as it performs tasks by implementing less effort. It helps in operating various machines and carry out heavy works easily. These gears are used in heavy industries which help in changing direction of rotational force from one axis to other. The Europe industrial gear market is restrained by the huge cost of maintenance. One of the major concern for the manufacturing industries is the maintenance of the gears. Moreover, the cost of the spares are high and would incur huge cost. Advancement in technology is an important opportunity in the Europe industrial gear market.Companies are focused on redesigning gears that are likely to produce less noise, heat and will increase the life cycle of the gears. On the basis of end use industries the industrial gear market is bifurcated into oil and gas, steel and manufacturing, material handling, machine tools, pulp and paper, automotive, mining, plastic, cement and others. Material handling accounted for the highest market revenue in 2015. It is one of the major part of industry practice and the material handling methods result in improved productivity and less cycle time. The material handling industry is primarily categorized as cranes and hoisting technologies. In this industry, gears are used in tower cranes, gantry crane, drilling rigs, offshore cranes among others. This segment accounted for the highest revenue share in 2015. Based on gear types the market is bifurcated into helical gears, bevel gears, worm gears, spur gears, herringbone gears, hypoid gears, crown gears, skew gears, spiral gears, non-circular gears, epicyclic gears, harmonic gears, magnetic gears and others. The helical gears accounted for the highest revenue share in 2015. Helical gears are the cylindrical gears having a slanted tooth trace. As the gear is curved, the angling makes the tooth shape a segment of a helix. These gears are engaged in heavy load applications and is used to transmit the power and motion between two parallel shaft and non-parallel shaft as well. The major constraints of this gear is that it requires more maintenance like proper lubrications, because of the greater sliding movement between the mating gear teeth. The helical gears are used in various applications like steel, fertilizers, plastic, food industries and many others. This gear accounted for highest revenue share in 2015.Moreover, the market is also segmented based on country that includes the U.K., Germany, Italy, France and Rest of Europe. Some of the leading players in the market are Siemens AG (Germany), Klingelnberg GmbH (Switzerland), Precipart Corporation (U.S.), RenoldPlc (U.K.), BonfiglioliRiduttori S.P.A. (Italy), BMT International S.A. (Luxembourg), Rossi SpA (Italy), Getriebebau NORD GmbH & Co. KG (Germany), NGC (China), Sumitomo Heavy Industries Ltd. (Japan) among others.